Average Weight	: 70 - 100 lbs. In 1863 a man named Pierre Megnin differentiated two types of sheepdogs, one with a long coat, which became known as the Briard, and the other with a short coat, which became the Beauceron. to improve the dog's look. 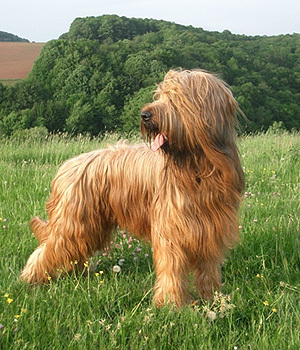 The Briard became popular only after the Paris dog show of 1863. In 1897 the first shepherd dog club was founded and both the Beauceron and the Briard were accepted into it. The Briard is a big, shaggy, intelligent dog with strong herding instincts. Briards are very protective and alert, and they make great watchdogs. Briards are kind, gentle, and generally obedient. Can be stubborn ~ some have a 'mind of their own'. Briards are best suited to firm, patient masters with experience training dogs. Briards need attention, activity, and entertainment. Briards do not do well being left alone. Families with children should ensure that a Briard is exposed to children early in life, and that the children do not tease the dog. Briards can live in an apartment but need ample daily exercise such as jogging. Briards have an exceptionally keen sense of hearing. Briards were owned by Charlemagne, Thomas Jefferson, Napoleon, and Lafayette. The Briard is a very loving and loyal dog. They are extremely intelligent without a hint of shyness. They are said to be a dog of heart with a light spirit and who become very loyal to their owners and families. They loyalty extends into being protective of their family as well so introductions to new people and animals should always be on the dog's terms. This includes new introductions into the family such as furniture or a new child. The Briard needs to be shown that new introductions are a positive experience. Further to this, socialization is very important with the Briard because of this protective nature. Socialization should start an early age and should consist of meeting all different kinds of people and going to several different types of places. If living in a home with children they are very loving and gentle when raised together. This is the same for other animals. The Briard is known to be a bit dog aggressive, but with proper socialization and handling can co-exist with other pets and animals well. The Briard is definitely not a dog for everyone. They can be very stubborn and independent and sometimes very unfriendly and fearful when not raised properly. They respond very poorly punishment or severe training. They can become very withdrawn and sometimes even violent when treated negatively. It is important to train them using a more positive approach. Clicker training and food reinforcement training are examples of positive training methods. This breed is very sensitive to being teased. Further to this, because of their training and history of being herding dogs, Briards are likely to nip at people's heels with the intentions of herding them where the dog thinks they should go. Care for the Briard is rated at being moderately high. Professional grooming is recommended about every 8 to 10 weeks and maintenance grooming is recommended weekly. The Briard is a working dog and therefore needs to have consistent exercise. They love to run and play and are excellent dogs for the active person. They are very happy to run along side a bike or go jogging. They also love to swim and would make excellent dogs for people who have cabins or spend lots of time near water. They will become restless if not exercised enough. The Briard is also well suited for defense training and police dog trails. The Briard's nature of working and herding combined with their level of intelligence make them quick learners. A combination of training and exercise is an excellent way to maintain a health dog both mentally and physically. Briard puppies and dogs need very consistent and constant training. They are highly intelligent dogs and therefore learn quickly and are capable of understanding and remembering a large vocabulary of commands. It is essential the Briard puppies are trained well and in the correct manner because otherwise they can become very withdrawn, suspicious, and sometimes aggressive animals. From the time the Briard is a puppy it should be regularly introduced into new situations involving different types of people, places, and other animals. It is important that these new encounters are done in a positive manner. When training the Briard it is essential to use positive reinforcement training because they respond best to love and affection and respond very poorly to negative attention. Unfortunately owners are not educated on how much training is involved with a Briard and often become overwhelmed. It is suggested that the Briard is not for first time dog owners. However, if a new dog owner does want to have a Briard for a pet, it is suggested that they obtain professional assistance with training. One specific problem is their nipping at heels of people to herd them. This can be reduced or eliminated by respect training. The Briard is highly intelligent with an incredible memory and has the ability to independently remember tasks. They are capable of remembering a large vocabulary of commands. With the proper training they can be very affectionate and loyal family pets. It is very important for the owners to have patience and train with love and firmness to obtain the best behavior from the dog.